A picture may be worth a thousand words, but a word made of pictures may be worth even more. 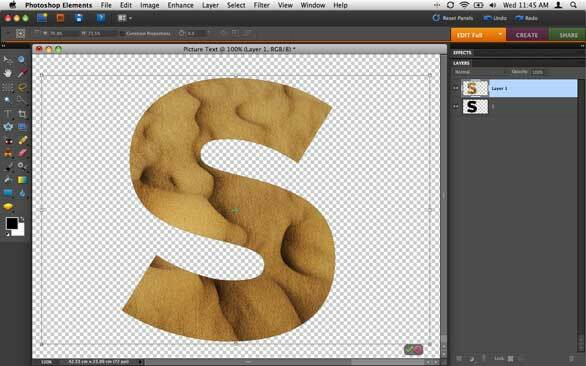 In this article, I’ll show you how to create eye-catching text by popping a picture inside the contours of letterforms. I’ve provided step-by-step instructions for Adobe Photoshop CS4 and Adobe Photoshop Elements 8, but the technique below can be adapted easily to other versions of Photoshop. The steps below work identically in Photoshop CS4 and CS5. The first step in this process is to create a new document. In Photoshop CS4, choose File ->New; in Photoshop Elements, choose File->New ->Blank File. Choosing the canvas size can be a bit tricky. It’s better to scale down than it is to scale up; scaling up may result in unsightly pixelation. So, base the height of your canvas on the height of your smallest source picture (e.g., if your smallest picture is 800 pixels high, make your canvas at least 800 pixels high). The width of your canvas should be as wide as the word you’re using. It may be difficult to determine the width at this point, so be generous. It’s best to err on the large side; you can always crop the canvas when the project is complete. Once you’ve entered the canvas size, set the Background Contents to Transparent and click OK.
Now it’s time to place a picture inside the text. This requires you to use the text tool to create a letter, convert the letter to a mask, and then paste your picture into the mask. As such, you need to tackle your word one letter at a time. First, I’ll walk you through the process of putting pictures in text with Photoshop CS4; and then, I’ll show you how to accomplish the same thing with Photoshop Elements 8. The key difference between the two is that you cannot use vector masks in Photoshop Elements 8. This means that once you convert the letter to a mask and insert a picture, the letter cannot be resized without introducing some degree of jagginess to the edges. After pasting your picture into the document, drag the vector mask to the picture layer. 1. Click the Text tool and then choose Window->Character. Select the font and the font style, and then set the font size to about same pixel height as your canvas. Type in your first letter and then tweak the font size if necessary, or use the Move tool to adjust its placement. The maximum font size you can choose is 1296 points; if you want bigger text, increase vertical and horizontal scale by the same percentage (i.e., 150 percent). 2. Choose Layer->Type->Convert to Shape. Now go to Layers (Window->Layers) and locate the current layer. You will see two icons: one will show the current color fill, and the other will show the vector mask. 3. Open the picture you want to insert into the current letter and select and copy it. Now return to the text document and choose Edit->Paste. The picture will be pasted into the document as a new layer. 4. Return to Layers. Now click and drag the vector mask thumbnail from your text layer onto the picture layer (likely named Layer 1). Your picture will now appear within the confines of the letter. The background color is the color of the original text, but you can easily change by double-clicking the lower layer’s color fill thumbnail. You can also turn off the lower layer by clicking the eye icon on the left side. 5. You can now reposition and resize the picture. Return to Layers and take a look at the topmost layer. Right between the picture thumbnail and the vector mask thumbnail, you’ll see a chain link icon. Click it once to unlink the picture and the mask. Now click the picture thumbnail to highlight it. You can then use the move tool to reposition the picture within the letter, or resize the picture by choosing Edit->Transform->Scale. Once you’ve pasted your picture into the selection, drag the corner control handles to resize it. 1. Click the Text tool and, in the options bar, choose the font and the font style. Now set the font size to same pixel height as your canvas or at least as large as the height of the image you're using. Type in your first letter and then tweak the font size if necessary. The maximum font size you can choose is 1296 points. You can get bigger text, however. Click your text once to highlight it and you’ll see a bounding box. Now click one of the control handles in the corner; then, in the options bar, you’ll see fields for horizontal and vertical scale. Simply enter the same percentage into each field (i.e., 175 percent) and click return or the green check mark. Alternately, you can use the handles to scale and transform the letter in whatever way you choose. 2. Choose Layer->Simplify Layer. This will convert the vector text to a bitmap. 3. Go to Layers (Window->Layers), and you’ll see a layer with your letter in addition to a locked background layer. 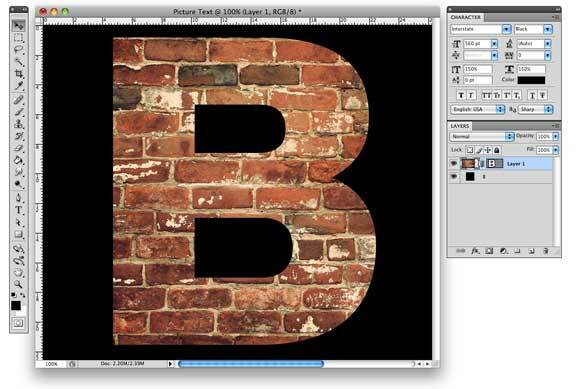 Command-click the layer thumbnail to make a selection of the letter. This selection will function as a mask. It's very important that you maintain this selection, so avoid accidental clicks on your canvas. 4. Choose Layer->New->Layer. Give the layer an appropriate name, such as “Picture 1,” and click OK. The selection will be carried over to the new layer. 5. Open the picture you want to insert into the current letter. Choose Select->All and then Edit->Copy. Now return to your document and choose Edit->Paste Into Selection. The picture will be pasted into the shape of the letter. 7. Go back to Layers. Click your original text layer and the locked background layer, then choose Layer->Delete Layers to get rid of them. What remains is your new letter, filled with your image, on a transparent background. Once you’ve completed a letter, repeat the process to complete your word. Make sure you use the same font size and be sure to position each new letter to the right of the preceding letter in your document (unless irregular lettering is your intent). You might also find it helpful to toggle the visibility of completed letters to avoid confusion. As a last step, crop the canvas to eliminate excess space. You can now export your word for use online, in printed flyers, or anywhere else you’d like to make an impact with colorful, creative text.